But weather forecasting on the Red Planet is likely to be even trickier than on Earth Mars has the same three-part pattern of atmospheric conditions as Earth, finds a new study by researchers at UCL and McGill University. This includes weather, which changes day-to-day due to constant fluctuations in the atmosphere; climate, which varies over decades and a third regime called macroweather, which describes the relatively stable regime between weather and climate. The results published in Geophysical Research Letters today also show that the sun plays a major role in determining macroweather. The research promises to advance scientists' understanding of the dynamics of Earth's own atmosphere - and could provide insights into the weather of Venus, Saturn's moon Titan, and possibly the gas giants Jupiter, Saturn, Uranus and Neptune. 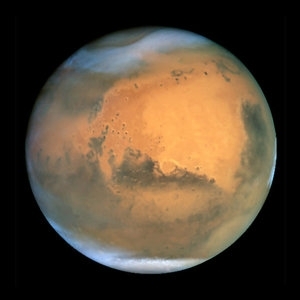 By taking into account how the sun heats Mars, as well as the thickness of the planet's atmosphere, the scientists predicted that Martian temperature and wind would fluctuate similarly to Earth's - but that the transition from weather to macroweather would take place over 1.8 Martian days (about two Earth days), compared with a week to 10 days on Earth. The scientists chose to study Mars for its wealth of data with which to test their theory that a transitional "macroweather" regime exists on other planets. They used information collected from Viking - a Mars lander mission during the 1970s and 1980s - and more recent data from a satellite orbiting Mars. We're going to have a very hard time predicting the weather on Mars beyond two days given what we have found in weather records there, which could prove tricky for the European lander and rover! "Our analysis of the data from Mars confirmed this prediction quite accurately," said Shaun Lovejoy, a physics professor at McGill University in Montreal and lead author of the paper. "This adds to evidence, from studies of Earth's atmosphere and oceans, that the sun plays a central role in shaping the transition from short-term weather fluctuations to macroweather." The findings also indicate that weather on Mars can be predicted with some skill up to only two days in advance, compared to Earth's 10 days. Co-author Professor Jan-Peter Muller from the UCL Mullard Space Science Laboratory, said: "We're going to have a very hard time predicting the weather on Mars beyond two days given what we have found in weather records there, which could prove tricky for the European lander and rover!"